by Mariah Zeisberg. Princeton: Princeton University Press, 2013. 276pp. Cloth. $29.95/£19.95. ISBN: 978-0-691-15722-1. Reviewed by Louis Fisher, Scholar in Residence, The Constitution Project. From 1970 to 2010 at the Library of Congress, Fisher served as Senior Specialist in Separation of Powers with Congressional Research Service and Specialist in Constitutional Law with the Law Library. lfisher11[at]verizon.net. His personal webpage: http://www.loufisher.org. In this ambitious work, Mariah Zeisberg explores the factors that determine U.S. military interventions abroad. What direction comes from the Constitution? How much is left to political considerations? The general theme developed in the book is that in the years following World War II, political judgments and interbranch deliberations have been more significant and consequential than “close readings of the Constitution’s text” (p.3). However, she does not dispense with the Constitution. Both Congress and the President assert their often conflicting views of their constitutional powers: “Branches that accompany their uses of the shared war power with a policy and constitutional position that the other branch may judge, and that use their powers in ways that are more rather than less responsive to the positions of their rivals, generate more constitutional authority for their behavior and for the larger war-making system” (p.38, emphasis in original). Interbranch deliberation “produces constitutional authority, which is a public good for a constitutional republic” (p.42). The first chapter asks this question: “Who Has Authority to Take the Country to War?” Zeisberg reviews President Barack Obama’s decision in March 2011 to provide military support for rebel forces in Libya and to push for the removal of Colonel Qaddafi. She points out “that the US Constitution’s allocation of the power to initiate hostilities is ambiguous” (p.5). Certainly there is some ambiguity, such as the precise dividing line between defensive and offensive actions. However, from 1789 to 1950 ‒ a period of 161 years ‒ all Presidents understood that the branch of government authorized to take the country from a state of peace to a state of war was exclusively Congress. All three branches understood that fundamental principle. Every President came to Congress to seek either a declaration of war or an authorization of war (as with the Quasi-War against France in 1798). Zeisberg acknowledges this pattern: “Before Truman, no president ever claimed a power to engage troops in large-scale hostilities regardless of Congress’s will” (p.18). The pivotal point is Truman’s claim in June 1950 that he could take the country to war against North Korea without coming to Congress for authority. That claim needs to be closely analyzed. I will do so later. Obama could not argue that U.S. military action against Libya was justified for defensive purposes. Libya had not attacked or threatened the United States. On April 1, 2011, the Office of Legal Counsel in the Justice Department concluded that Obama’s actions in Libya did not constitute “war,” in part because there were no U.S. casualties or any prospect of casualties. Following that reasoning, a powerful nation could pulverize a weak nation and there would be no “war” if the aggressor suffered no casualties. Does Zeisberg agree with OLC’s legal reasoning? She does not indicate her position on that issue, but appears to accept State Department Legal Adviser Harold Koh’s argument that the strikes in Libya amounted to a “limited mission,” not war (p.13). On that same page, Zeisberg offers this broad position: “What counts as war is a matter of political judgment, and national consensus has often permitted forms of executive bellicosity” without the approval of Congress. To Zeisberg: “Looseness in the very concept of war creates textual space for opportunistic presidents to evade the restrictions” that defenders of legislative prerogatives demand. That has been the record from 1950 forward. “Neither the consensus politics of the founding, nor those of today, are reliable resources” for congressional advocates (p.13). The tension between presidential and congressional control over the military is not resolved, she says, through constitutional text or framers’ intent. Vagueness in the text is “consequential for war politics.” Later in the book, Zeisberg offers support for Obama’s use of military force against Libya. She notes that he “cited Clinton interventions in Haiti and Bosnia as precedent for Libya” (p.251). However, she does not attempt to independently evaluate the legal or constitutional grounds for Clinton’s actions to determine if he acted properly and with adequate legal justification. Rather, she relies solely on the simple fact of precedent to provide grounds for Presidents to order unilateral military operations. There is no reason to automatically accord legitimacy to every precedent offered by a President. They vary in their credibility and trustworthiness. As Zeisberg explains, Nixon cited Kennedy’s precedent in the Cuban missile crisis for intervening in Cambodia in 1969-70, but it damaged him politically (pp.151-54). The major precedent is Truman and Korea. I will now examine two categories created by Zeisberg: “pro-Congress insularism” and “pro-presidency insularism.” She describes the first as consisting of “partisans of the legislature” and “advocates of the legislature” who believe that Congress has the exclusive power to decide to introduce military forces into war, though in emergencies (such as repelling sudden attacks) the President may act unilaterally (pp.10-11). In the pro-Congress category she includes the following: Michael Glennon, Stephen Griffin, Louis Henkin, Charles Lofgren, William Michael Treanor, and myself. It would have been more accurate to describe these individuals as pro-Constitution rather than congressional partisans and advocates. All have publicly criticized Congress for its actions (and inactions). All have defended Presidents when merited. On the basis of research and analysis, they conclude that the branch constitutionally empowered to take the country from a state of peace to a state of war is Congress, not the President. It would be fair for Zeisberg to attempt to uncover deficiencies in their constitutional analysis, but she does not do that. Instead, she creates a pro-Congress category and applies the terms partisans and advocates to individuals who conclude that the legitimacy of war should be judged by constitutional analysis and not left solely to political calculations. As to the second category, “pro-presidency insularism,” Zeisberg says it argues that “the executive branch has the constitutional authority to engage in defensive military hostilities, and the president is the only judge of the practical meaning of this category” (p.14). Actually, the individuals that Zeisberg places in the pro-Congress category also recognize that the framers expected the President to respond to “sudden attacks,” that the President would always be present on such occasions, and that Congress might be in recess or adjournment. Of course there can be legitimate debates about what is defensive and offensive. However, the two categories created by Zeisberg agree that the President may repel sudden attacks. That agreement has no application to Obama’s military action against Libya because his military operation was offensive, not defensive. To Zeisberg, the Constitution does not “settle” the question of war authority. Instead, a new constitutional politics was created by President Truman in June 1950 when he took the country to war without congressional authority. Zeisberg does not analyze the political cost to Truman and the constitutional order. The Korean war became a stalemate, with heavy deaths and casualties among U.S. soldiers. By 1951, Truman had lost credibility. The war became so unpopular that in 1952 the Republicans took the White House with Dwight D. Eisenhower and gained control over both houses of Congress. Stephen Griffin, in Long Wars and the Constitution (2013), offers this impact of the Korean War: “the constitutional damage was real. Truman set the precedent he wanted and it was a very bad one. He created a new constitutional power that future presidents would wield poorly” (pp.76-77). “As with the later presidencies of Lyndon Johnson and George W. Bush, Truman lost much of his practical authority to govern because of a foreign war” (p.89). Zeisberg is correct that Truman’s decision radically changed the political power between the President and Congress. Other Presidents, including Clinton and Obama, built on Truman’s precedent. The process here differed from actions taken from 1789 to 1950. Presidents in that period had to obtain congressional authority before they acted. After 1950, they could act first and see how Congress reacted. Given Zeisberg’s emphasis on the importance of deliberation, one would expect her to be critical of Truman’s decision to act alone against North Korea. She does not criticize him. Griffin does so explicitly: “An executive-led process also has tended to increase the secrecy of decisionmaking, further reducing the quality of interbranch deliberation” (p.97). Zeisberg repeats President Truman’s remark in June 1950 that his intervention in North Korea was a “‘police action,’ not war” (p.13). He did indeed say that. In using this language, he hoped to legitimize his action as something within the President’s authority. In making the distinction between UN “police actions” and war, Truman seemed to concede that decisions on war are for Congress, not the President. Was his distinction credible? Zeisberg does not dispute Truman’s characterization and much of the book supports Truman’s intervention in Korea. Secretary of State Dean Acheson, who initially agreed with the term “police action,” conceded the obvious at a Senate hearing in June 1951 by admitting “in the usual sense of the word there is a war.” Federal and state judges, forced to analyze contracts that called for claims “in time of war,” had no doubt that military actions in Korea constituted war. For Zeisberg the central issue is that constitutional war authority was substantially changed: A president can authoritatively engage the country in military action if that offensive action is justified to the nation and to the Congress. Zeisberg offers an additional justification for unilateral presidential wars, and it is a point that is central to her book: “I argue that independent acts of presidential war are more constitutional to the extent that they are interpretable in light of a security order that is itself constitutionally authoritative . . .” (p.53). In other words, the Cold War security order that developed after World War II in the struggle against communism – with the participation and encouragement of Congress ‒ helps justify, for Zeisberg, presidential military initiatives. It is certainly true that when Truman acted unilaterally in June 1950 initially he met with general public support and little opposition from members of Congress. Still, was that precedent valid and constitutionally sound? Truman went to war against North Korea solely on the basis of Security Council resolutions. Do those resolutions provide independent authority for presidential wars? Could the Security Council act as a substitute for Congress? The UN Charter required each member state to decide for itself its “constitutional processes” to offer assistance for UN military actions. To decide the constitutional requirement of the United States, Congress passed the UN Participation Act of 1945. Section 6 authorizes the President to negotiate a “special agreement” with the Security Council for military action. The agreement “shall be subject to the approval of the Congress by appropriate Act of joint resolution.” The President was therefore required by law to obtain congressional authority before engaging in a UN military action. Truman signed the bill without voicing any constitutional objections. Plainly he violated that statute in 1950. True, his violation did not prompt Congress to block his intervention in Korea, but it was a violation nonetheless. Another way of understanding this issue is by asking: May the President and the Senate through the treaty process transfer Article I powers of Congress to an international body like the UN or to regional organizations like NATO? My answer: “no.” That doesn’t appear to be Zeisberg’s position. The UN Participation Act is discussed in several passages of the book. Zeisberg states: “The UN Participation Act clearly ‘delegates’ war authority with its special-agreement pathway. Once agreements are negotiated, the legal power to commit troops rests with the UN and the presidency, regardless of Congress’s views in each case” (p.134). That description is entirely contrary to express statutory language. She maintains that when Congress created the UN and NATO it “created a politics ‒ not just a set of legal enactments ‒ that enlarged the scope of an already-existent independent presidential war power to defend core security interests of the nation” (pp.134-35). She is correct that the UN and NATO treaties have had the practical effect of allowing Presidents Truman, Clinton, and Obama to circumvent Congress and seek “authority” (even if illegitimate) from other bodies. However, I don’t think this scope of executive latitude can be properly described as “already-existent.” No President before Truman ever had the capacity to obtain war power from an organization outside of Congress. As Zeisberg explains, Truman “defended his actions in the Korean War as inherently authorized by the commander-in-chief clause” (p.14). Truman did make that claim. Because Zeisberg does not indicate her disagreement with the position that Presidents possess “inherent” power (beyond the control of the other two branches) to use military force against other countries, one might assume she accepts that source of authority. When Truman seized steel mills in 1952 in order to prosecute the war in Korea, an attorney from the Justice Department told District Judge David Pine during oral argument that the President possesses “inherent” power to take such actions and courts are powerless to control the President. Judge Pine wrote a blistering decision that repudiated the administration’s reliance on inherent power (Youngstown Sheet & Tube Co. v. Sawyer). The Justice Department attorney used the word “inherent” twenty times in his presentation to Judge Pine. When Solicitor General Philip Perlman argued the case before the Supreme Court, he did not use that word even once. The Court, divided 6 to 3, struck down Truman’s action (Youngstown Co. v. Sawyer). 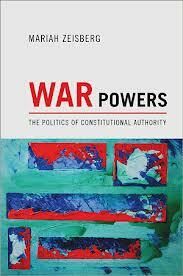 The claim of inherent presidential power is a key issue on the scope of the war power but is not analyzed in this book. Zeisberg makes several insightful points in challenging the belief by the pro-presidency camp that Presidents have exclusive control over the armed forces and have the advantage of being more flexible and acting more quickly than Congress. She correctly explains that flexibility “is not the only value for achieving a sound security policy” (p.16). Congress is “well-positioned” to contribute the values of wisdom, deliberation, stability, and consistency. Some lawmakers “have more expertise than the president on particular security problems, and they may have creative perspectives borne of long experience in difficult areas” (p.16). Moreover, the “time and effort it takes to respond to Congress is time and effort spent toward convincing many people that the policy chosen is in the national interest, and toward building and sustaining policy architectures along that path” (p.16). One strength of legislative governance “is precisely its ability to offer a forum for the public expression of divergent lines of reasoning on matters of public concern” (p.36). In comparing the branches of government, Zeisberg calls the presidency “a unitary office” that is “the most efficient of the three, with the capacity to deliver quick military responses” (p. 26). There are downsides to “efficiency” and rapid decisions. As Zeisberg notes about Nixon’s bombing of Cambodia in 1970, he had political power to do that, but the decision triggered public and congressional opposition because he was escalating a war he had promised to end (pp.151-54). President Lyndon Johnson was able to escalate the war in Vietnam, a move that is almost universally condemned. President George W. Bush was able to successfully advocate war against Iraq, based on a series of false intelligence claims that Saddam Hussein possessed weapons of mass destruction. That military initiative is also widely deplored. In Chapter 5, Zeisberg offers extensive criticism of Congress’s effort to investigate the Iran-Contra affair under President Reagan. Legislative investigations typically have errors by lawmakers and staff, but not the ones that Zeisberg identifies. She writes about the Iran-Contra Committee: “Nor did they gather information on the security consequences of US involvement in the war in Nicaragua, or even the history and consequences of the struggles between the Sandinistas and Contras” (p.197). That historical background appears on pages 25-27 of the committee report, including information on the Sandinistas and Contras. Also on page 197 of Zeisberg’s book: “Apparently the Iran-Contra Committee did not understand the legislature’s capacity to form broad judgments on security policy as relevant or useful to its confrontation with the president.” The committee understood that capacity and set forth broad institutional and constitutional judgments in the Executive Summary on pages 3-22 and in making 27 recommendations on pages 423-25. Zeisberg states: “Yet the majority report fails to interpret or defend Congress as a whole” (p.213). That purpose is reflected throughout the report’s analysis and recommendations. According to Zeisberg, Congress “even failed to discuss why trading arms for hostages is a bad idea” (p.215). That point is made repeatedly in the Executive Summary and other sections of the report. Zeisberg's analysis is presented within the framework of political theory, including relational conception, settlement theory, processual standards, presentist forms, presentist reasons, and presentist values. As result, the book may not be as accessible to some readers as it might have without that framework. A final issue. Those who promote independent and plenary presidential power in the field of external affairs frequently cite Justice Sutherland’s dicta in the 1936 Curtiss-Wright case, where he borrows the “sole organ” phrase from a speech by John Marshall in 1800 when he served as a member of the House of Representatives. Scholars have repeatedly demonstrated that Sutherland completely misrepresented the speech. At no time did Marshall promote inherent, plenary, or independent presidential authority over war. That is clear by reading the speech; http://www.loufisher.org/docs/pip/444.pdf. Zeisberg mentions Curtiss-Wright in various places (pp.89, 251), but does not analyze Sutherland’s misuse of this speech. It is important to explain Sutherland’s error because it continues to be relied on by courts and scholars to defend unchecked presidential power. United States v. Curtiss-Wright Corp. 299 U.S. 304 (1936). Youngstown Sheet & Tube Co. v. Sawyer 103 F. Supp. 569 (D.D.C. 1952). Youngstown Co. v. Sawyer 343 U.S. 579 (1952). © Copyright 2013 by the author, Louis Fisher.